Enter the MTV "Score SKINS Music Project"
OurStage and MTV have partnered to launch the "Score SKINS Music Project", giving artists nationwide a shot at getting their original music featured on the hit teen drama SKINS. 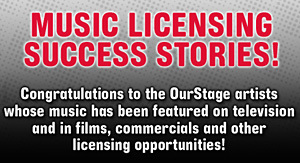 Music supervisors from MTV will select artists from the "Score SKINS Music Project" to be featured on the show. Beginning October 21, 2010, all rock, pop, urban, singer-songwriter, electronica, dance and instrumental artists can submitt their best original track for consideration. All submissions must be full length with or without vocals. Entries may not contain any "samples". Artists must own 100% of the rights to the music they submit. Artists must be eighteen (18) years of age or older at the time of entry. Individual artists or a band member must be a legal resident of the 50 United States. Submission materials that are determined, at the sole discretion of the Sponsors, to be classified as rock, pop, singer-songwriter, urban, electronica, dance and instrumental will be eligible. *The sponsor reserves the right to review all entries in the event that a suitable winner is not found in the top 100 rankings.